I’ve had it on the calendar so many times (just wait…truffles…pumpkin…chicken…I’m not sure why it hasn’t happened, but when it does, it’ll be awesome), but it seems like it always gets bumped. Or I don’t want to make it. Or it’s too hot. Or some kind of lame excuse. It starts with a bread cubes (If you can leave them out for a few hours so they get nice and dry, that’s great. If not, just place them on a baking sheet and bake them at 350 for 10-15 minutes or until they’re dry but not toasted. ), eggs, apples…as well as vanilla yogurt, milk, and spices. Your kitchen is going to smell really, really good while this baby’s baking. Just warning you. And the caramel sauce formula is a simple adaptation of similar recipes, they always seem to be called either “caramel sauce”, “brown-sugar sauce”, “butterscotch sauce” or “brown-sugar butter sauce” or some variation thereof. I think this one tastes more caramel-like than anything else, so that’s what we’re calling it here, okay? Okay. Serve with some vanilla ice cream. So evil, right? Right. Where’s the receipt do I can Wright it down? Looks so good. Want to make it for Christmas morning. I would like to know if you can freeze the Caramel Apple Bread Puddind and if so at what stage before baking or after it is baked. Lynn, did you try freezing it? I’d love to know if it worked well for you. If I were to try, I’d freeze after baking but before adding the sauce. Thanks! By heavy cream, do you mean 18 percent or whip cream? When you say make it the night before and pop in the oven for breakfast. do you mean put it together the night before then bake it in the morning or just put it in the oven to reheat ? Can this be adapted to the slow cooker? This sounds amazing! And if so do you have the directions? 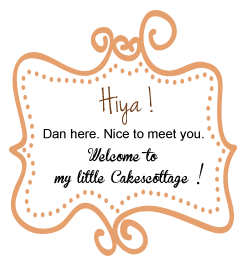 > WHAT type of bread would you recommend ? I can’t speak to that as I haven’t tried it, but what I did was sautée the sliced apples in butter and brandy before using it in the recipe; it turned out really nice. 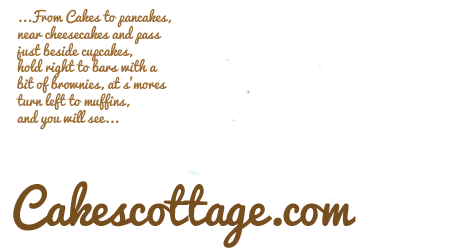 Google caremel-whiskey sauce recipe! I’m going to try to make this with Crown Apple. OMG absolutely delicious. This is going to be a favourite. This is DELICIOUS!! It will be served at our family Christmas brunch this year. The only two things I did differently was substituted cinnamon bread in place of the white bread and omitted the nutmeg (because I didn’t have any). Thanks for sharing this recipe. I’m anxious to try more. Do you have a Facebook page? I looked but couldn’t find one. looks so yummy . I have to make this. #10 in the Instructions should be a note in the ingredients list or moved to #2 in the instructions list. 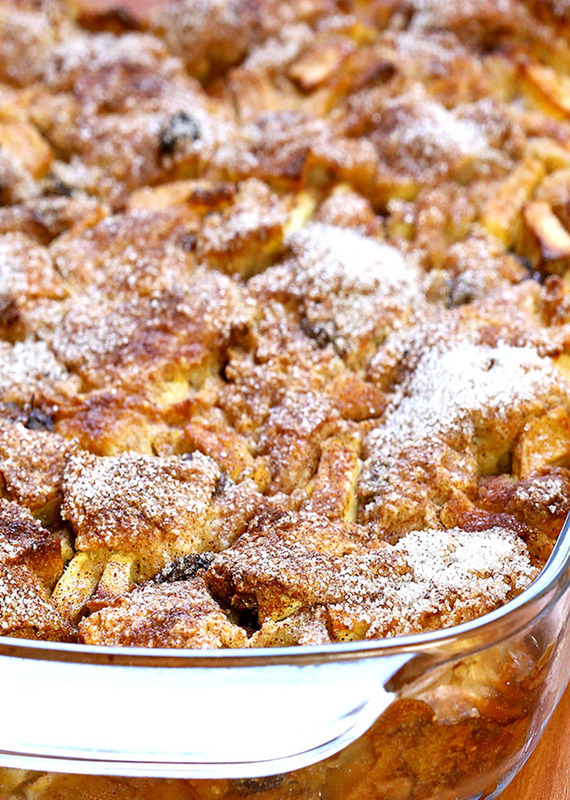 What type bread works best for the Apple Pie Bread Pudding? Try adding coconut coffee granules ,about 2 tbs . It worked well for my tastes. This recipe was super EASY to make. I had a ton of left over baguette from a team pasta dinner and apples on hand. Definitely a keeper! Instead of using yogurt, is it possible to just use more milk and add my own vanilla? I can’t wait to see recipes from you..
A friend sent me a recipe from you and it was really good. 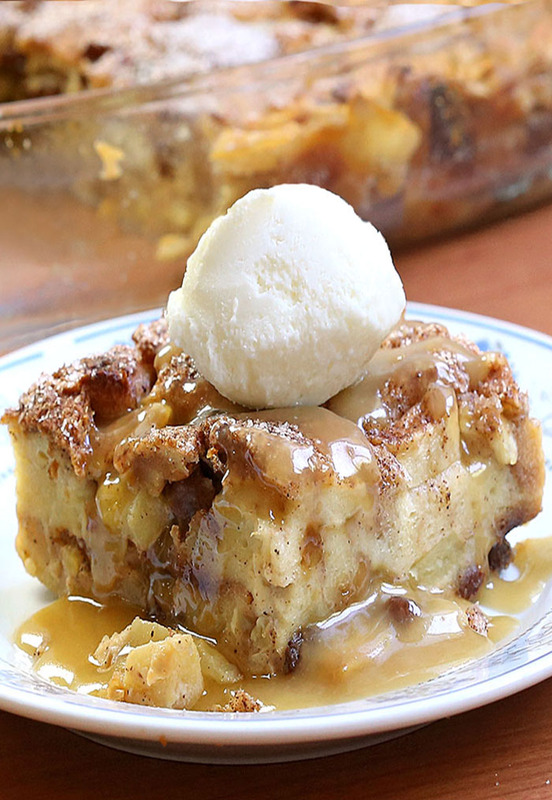 Do you pour the caramel on the bread pudding after it’s dine baking or individually before serving? I suggest using left over croissants for this dish too! And whisky in the sauce sounds a great idea! Perhaps you can answer a question for me about something that has always puzzled me—What is the purpose of only using dry bread? Many of the instructions for bread puddings say to do this but never say what is the reason for it? What happens if you use fresh bread? The fresh bread gets soggy. You need a dry bread. You don’t want slush. Would I add another apple if I didn’t want to include the raisins?